A specialist in landscapes and nature, Colin Roberts turned professional in 2005. He has received a number of awards for his nature images, including International Garden Photographer of the Year and the Royal Horticultural Society’s Photographer of the Year. Many deciduous trees have a stark beauty in their leafless form, and make worthy landscape subjects throughout the winter. Those trees growing on hilltops and ridges are usually framed against the sky, so they can be photographed in almost any weather. However, trees that grow in valleys or parkland can be difficult to photograph in isolation, especially if there are buildings or other trees close by. The answer to this is to shoot them in a misty atmosphere, when the mist is thick enough to obscure the nearby surroundings. This effectively sets the tree against a blank canvas. Many trees have an irregular shape or a marked lean, so try viewing them from various angles in order to find the one that is most appealing. 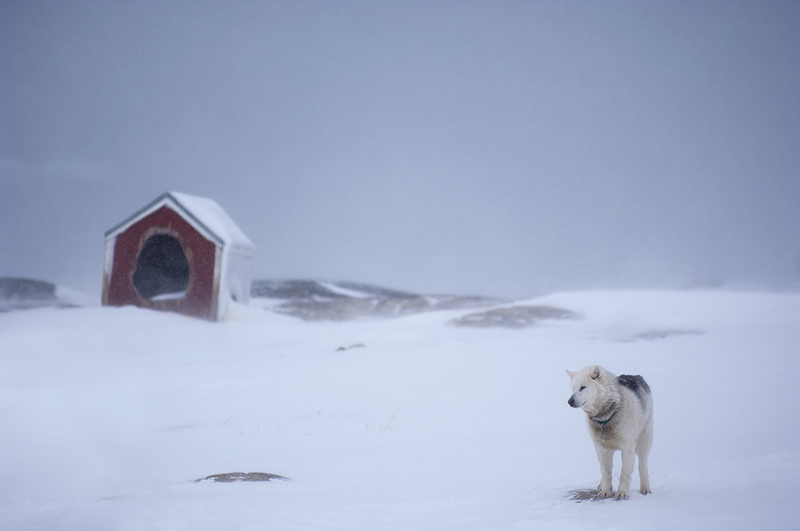 For a snow scene with a difference, try shooting while the snow is falling – it’s a great way to capture the wintry atmosphere. The key is to pick a suitable subject, so avoid wide-open views where the snowfall effect is lost, and instead build your composition around a strong feature, such as a tree, bridge or small building. Choice of shutter speed will determine how the falling snow is rendered, so relatively long exposures of 1/8sec or less will show snowy streaks rather than flakes. I prefer to stay at around 1/60sec to capture a slight sense of movement without overdoing the effect. Try to shoot away from the direction of the falling snow and fit a lens hood to help protect your element from stray flakes. A snow-laden landscape is such an inspiring sight that it can be tempting to shoot rather randomly, with the result that none of the images really stands out. In these situations it’s more important than ever to work on your composition and not to shoot snow for the sake of it – we all know it’s better to come away with one or two great pictures than a whole batch of mediocre ones. Remember to isolate the main focal points and use linear elements to add perspective and depth. 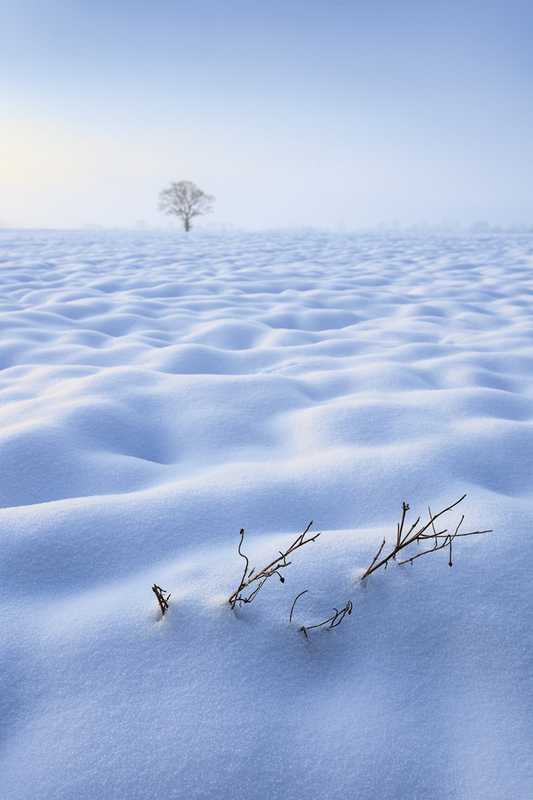 Also, exploit the simplicity that a blanket of snow brings to the landscape. Employ a variety of focal lengths, but be careful not to overuse wide angles. There is so much white in a snow scene that the perspective of a wideangle lens can easily overdo it, pulling in large areas of featureless white space that cause the shot to lose impact. Ice, frost or snow can transform the look of some natural subjects, bringing a short-lived beauty that shouldn’t be missed. 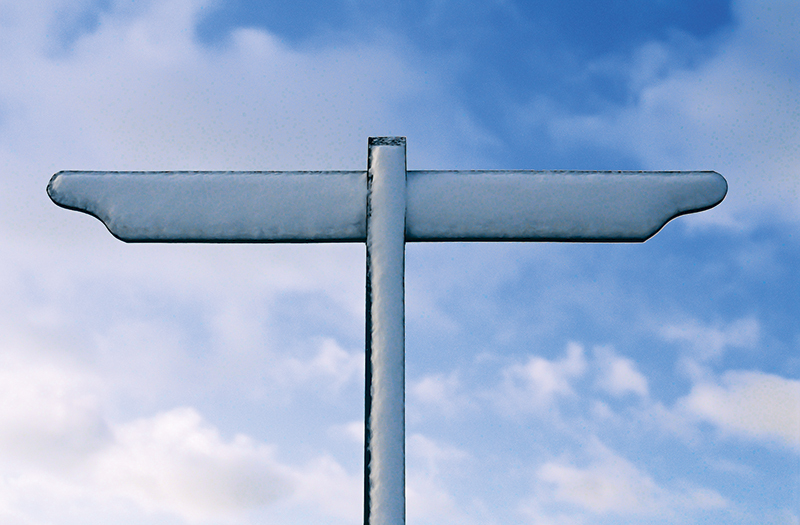 Equally, even the most mundane man-made objects can look appealing or quirky when coated in crisp white snow. So in cold snaps look out for wintry details like the shapes and patterns in frosted leaves, bubbles trapped in frozen puddles, or even snow-clad signposts and fences. A standard 50mm lens will focus close enough for most subjects, while a short telephoto will help you isolate details from a more comfortable distance. Of course, capturing winter details doesn’t depend on extreme weather – look for texture in tree bark, the intricate patterns in stalks of bracken, or the colours in moss and lichen – all of which can be shot in any conditions. avoid, but it can produce eye-catching results. The best approach is to obscure the sun with part of your subject, as this will effectively mask its brilliance and reduce the risk of lens flare. The result is a dramatic high-contrast image that shows the subject in virtual silhouette. Tilting the camera down slightly will include any shadows that radiate from the subject into the foreground, giving a more dynamic edge to the composition. 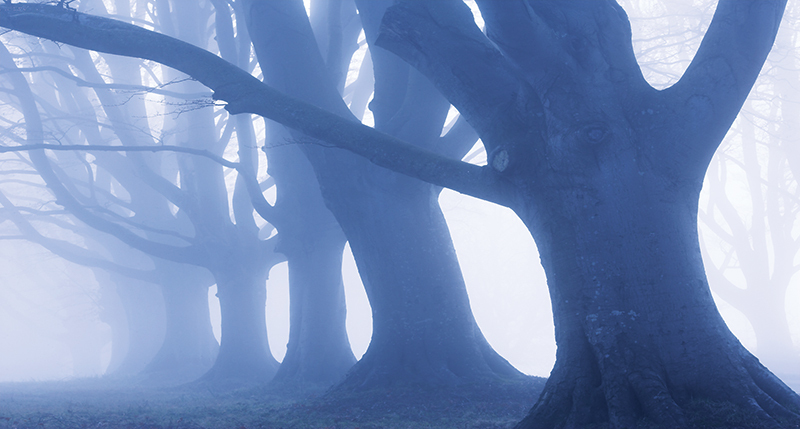 Vertical structures, such as trees, spires or lighthouses, make ideal subjects for this technique. A planned approach is a key factor in successful landscape photography. This is perhaps more true in snowy weather than at other times because of the dramatic effect snow has on subject matter, not to mention the fact that it can arrive unexpectedly. So to avoid venturing out at a moment’s notice on a snowy morning with no clear idea of where you’re heading, it’s crucial to make a list of suitable snowy locations so you’re prepared. With an ordered list you can plan your itinerary before setting out, based on the conditions at the time. As always, safety comes first, so monitor local weather reports and be clear on the extent of the snowfall. A dusting of snow soon transforms hills and open areas, but woodlands need more of a thick-snow look to be appealing. Early starts ought to get easier in winter when the sun rises later, although it never feels that way when you have the cold to contend with. However, the tortuous routine can pay dividends – for the light, of course, but also if there’s fresh snow on the ground. Footprints and melting slush can all spoil a snow scene, so set out before dawn if you want pristine views of virgin snow. Available shooting time is extended because a blanket of snow raises ambient light levels by several stops, allowing you to start earlier. It’s also worth being on location as soon as you can in frosty conditions before the sun begins to melt away the beauty. Also bear in mind that frost lingers much longer in areas of shadow, so head for the high-points first and leave the valleys and hollows for later. By its very nature, snow lends itself well to mono images. With so much colour stripped away and many features reduced to mere outlines, it becomes much easier to focus on shape and form. What’s more, many of the best black & white images are of high-contrast subjects, which deliver punchy monochromes with pure whites and solid blacks – so snow certainly fits the bill. 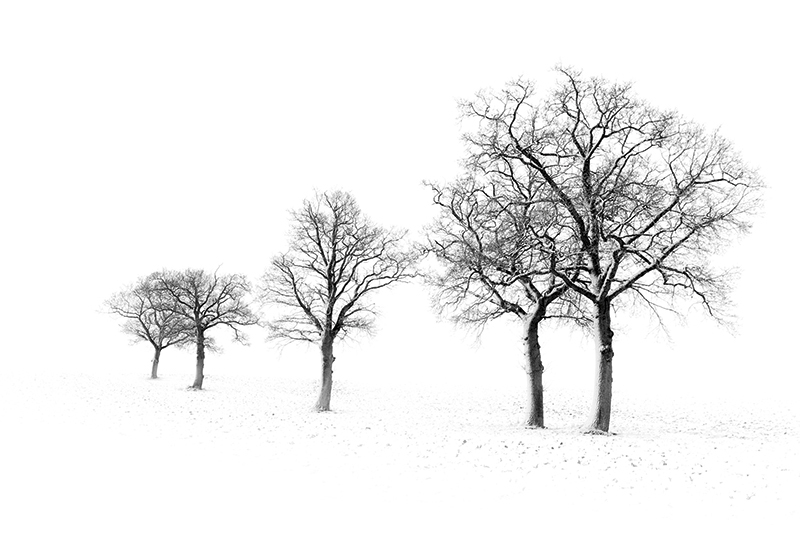 Isolated buildings or trees often have great potential in mono, as do snow-clad walkways and jetties. If you like abstract compositions, then black & white is always a good option, and no less so in snow. 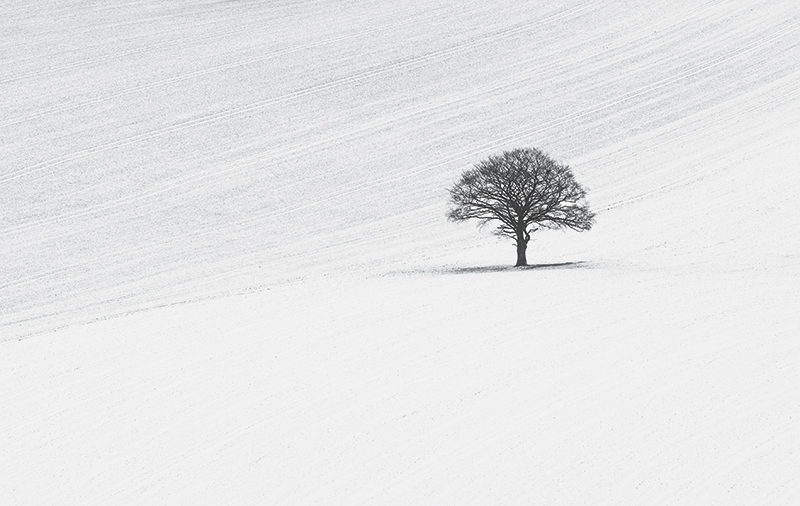 Try creating some simple graphic images by shooting patterns or lines that form in the snowy conditions, using a telephoto lens to crop out surrounding distractions wherever possible – less is more with this type of image. Jeremy Walker is an award-winning photographer specialising in high-quality landscape and location photography around the world, for use by advertising, design and corporate clients. A belief in ‘quality is everything’ serves Jeremy and his clients well. Always carry spare, fully charged batteries. Batteries hate the cold and will soon start to drop in power and efficiency. The colder it is, the more quickly the batteries will fade, so combat this by keeping the batteries warm. Don’t keep them in your camera bag, which will invariably be close to or on the frozen ground. Instead, keep them in an inside pocket and protected with a soft cloth. If you are shooting in winter conditions and the light is fantastic but your battery has failed, completely turn the camera off and remove the battery. Try to warm the battery up in your hands, in your clothing or in any way you can (except a naked flame). Just a little bit of warmth could give you those crucial extra few frames so you don’t miss out on that special shot. review and even camera settings. In cold conditions, use the monitor as little as possible. You do not have to review every image or check every single histogram. Discipline yourself to using the monitor only once every three or four frames, and use the good old-fashioned viewfinder a bit more often instead. A head torch will leave your hands free for the important stuff, such as shooting images or eating chocolate. Not only is it useful to help see the camera settings in fading light, but it will also help you to see your way back to the car – you may go out in bright sunny conditions and not even consider the fact that it will get dark later on. A torch is also a useful distress beacon if you get into trouble – use six long flashes followed by a gap of a minute and then repeat. Be aware that shooting beautiful snowy landscape scenes with a blue sky will often lead to the shadows becoming dark blue. In the right image this is not a problem, but so often in a winter scene cold blue shadows do nothing for the overall feel of the image. Experiment with the white balance settings: take your camera off auto white balance and perhaps set it to 8,000K for a warmer feel. It will take some experimentation, but just try to get rid of those cold blue shadows. If it has snowed and you have nothing to shoot, get drawing in the snow. Use the fresh snow as a blank canvas, from love hearts and smiley faces to snow angels. Consider the direction of the sun first so your artwork will be nicely lit from the side or behind, and try not to walk across your handiwork before you have shot it! If you are struggling for winter subject matter to photograph and you cannot travel far, you will find that there is usually some form of water nearby, even if it is just a pond, puddle or stream. Water is a great winter topic because of the infinite amount of patterns and textures that are created. Think close-up or macro rather than wide landscape. You could create your own puddles and effects by putting trays of water out overnight when it gets really cold. Put leaves (or anything!) in the water and see what sort of patterns, shapes and textures you can shoot the following morning. Use human figures to give your winter scene a sense of scale and place, and if they walk into your scene it’s easy to get rid of the footprints in post-production. A figure can be distant, silhouetted or colourful, but it will certainly help to tell the story within the image. Making life as comfortable as possible for yourself when out shooting is paramount. If you have room, carry a small Thermos flask filled with a hot beverage such as tea, coffee or soup, and carry comfort food such as chocolate or cake. Hanging around in the cold isn’t fun on an empty stomach. There is nothing worse than being cold on location – trust me, I know, because as I write this I am in Iceland. Use layers of clothing and not just one big thick garment. Merino wool is a fantastic base layer (look for the Icebreaker brand at good outdoor shops) and build up from there. Footwear is just as important as coats, jumpers and jackets. With cold feet, you will soon lose the will to hang around and wait for the perfect light. Proper winter boots and two pairs of socks will go a long way to helping you have hours of fun standing around in the snow. Although wellies are good for keeping snow melt and rain water out, if you are using them in winter they must be of the Neoprene-lined thermal type, as standard wellies have virtually no thermal properties at all. 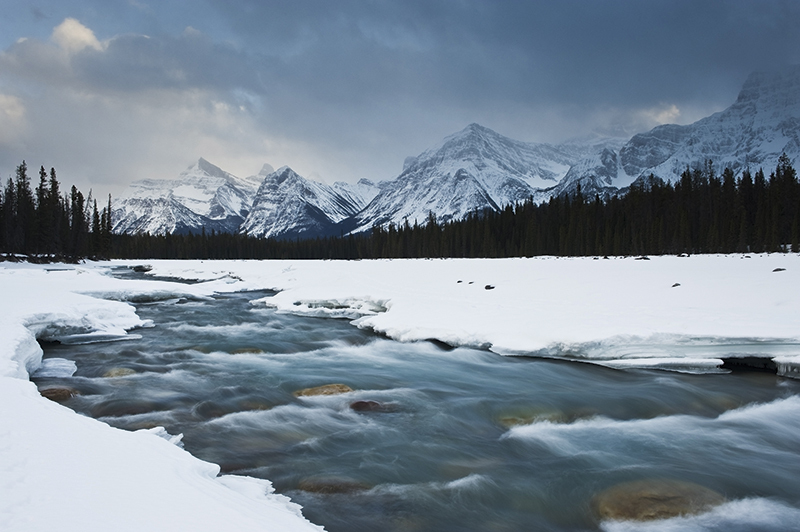 Flowing water with snow and ice in the foreground or background, or moving clouds in a winter landscape, are very fertile grounds for the use of neutral density filters. Introduce blur and motion, and experiment with patterns and textures that are created by longer exposures. 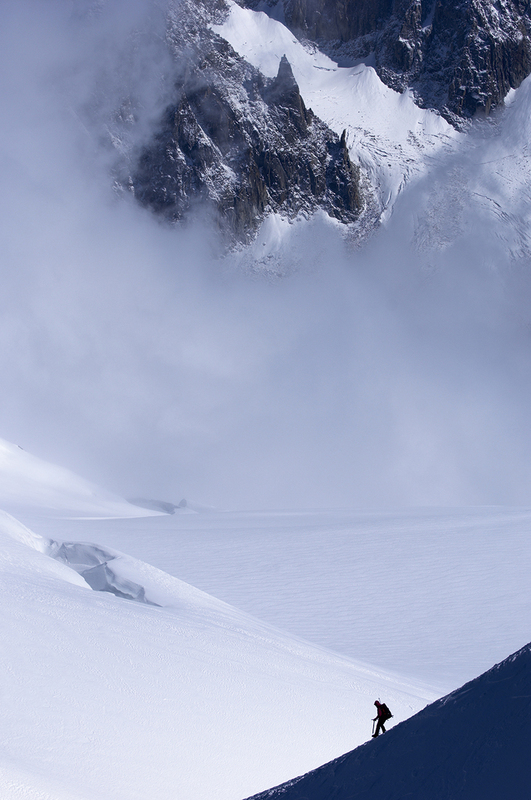 Shooting in soft snow can be a problem as your tripod can just sink in, leaving you with a very short working height. Recent winters in the UK may not have seen huge snow drifts, but if you are shooting where snow is likely both Manfrotto and Gitzo make saucer-sized discs that fit to the bottom of each tripod leg, enlarging the footprint and spreading the weight. These are also useful for using tripods on sandy beaches to stop them sinking into the wet sand. Winter scenes can look a bit bare or bland if your are not careful – just far too much white emptiness. Try to introduce a small area of localised colour to give an image a bright focal point and lend some impact or mood to the scene. A single solitary colour, no matter what it is, will give life to the image. 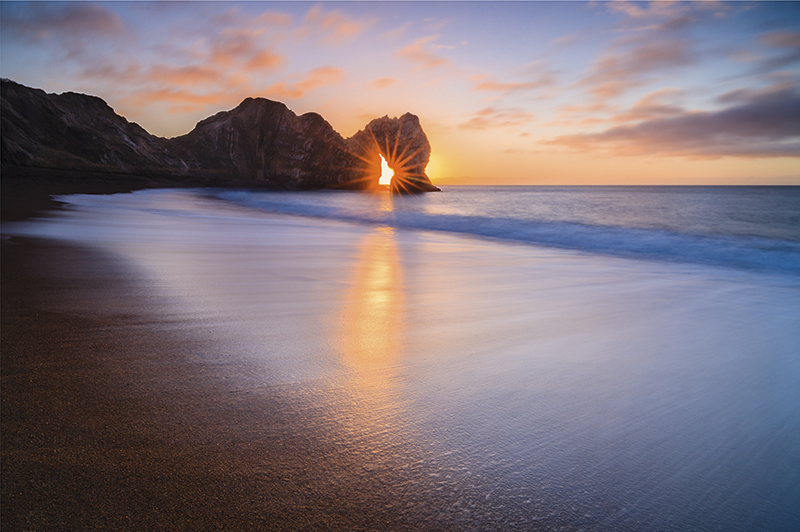 Mark Bauer is one of the UK’s leading landscape photographers. Having become interested in photography while living abroad in the early 1990s, he is now renowned for his evocative images of the south-west of England. There are certain shots that are only possible in winter, due to the position of the sun. There is a very short window for some opportunities, with certain lighting conditions only lasting for a couple of weeks or so. As you may be restricted by the weather, you need to make the most of any opportunities that arise – and also be persistent. Multiple visits to a location may be necessary. This can be tedious, but remember that you won’t get another opportunity at some shots for another 12 months. Use maps and a sun compass, or an app such as The Photographer’s Ephemeris, to help you plan. The light and weather can be dramatic in winter, but such weather is not always good for your kit so make sure you protect it. There are plenty of commercially available weather covers, but a good DIY solution is a shower cap, of the kind that is supplied in hotel rooms. If it starts to rain when you’ve set up, pop it over your camera and lens, and then remove it when the shower passes. A chamois leather is also good for wiping down your equipment if it does get wet. 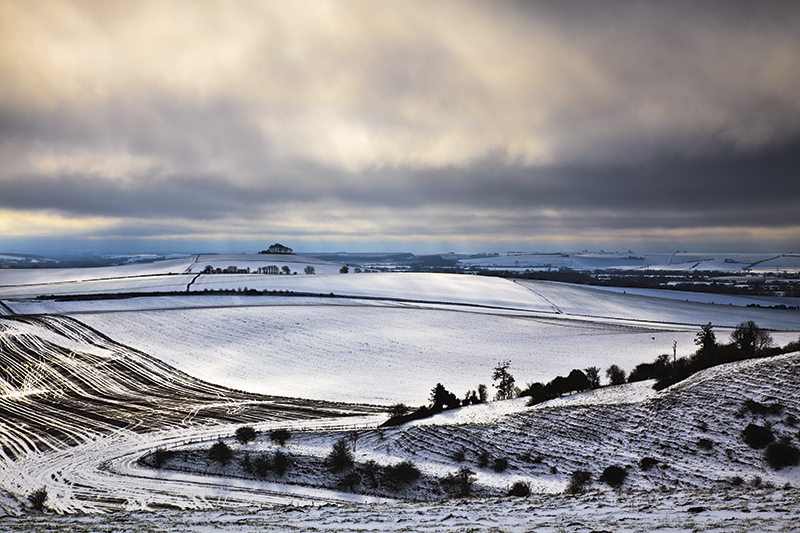 The weather in winter is often dull, but that doesn’t have to mean dull photographs. On a cloudy day, there may not be dramatic light falling on the land, but there can be plenty of interest above it, with dark, stormy clouds rolling across the sky. In fact, so long there is some texture in the sky, it’s possible to create interesting shots. Make sure you give plenty of emphasis to the sky in the composition, and include a clear focal point in the frame. Graduated neutral density filters are usually used to balance exposure differences between bright skies and dark foregrounds, but they can also be used for artistic effect, turning the appearance of a textured grey sky into a threatening, stormy one. Rural landscapes generally look dreary in dull weather, but coastal shots can still be effective as you can make use of strong structural elements such as groynes and piers, and contrast these with the motion of waves and clouds. Since taking up photography, Justin’s images have been published in numerous books and magazines. He also runs one-to-one landscape photography workshops in East Anglia for photographers of all levels, with workshops for small groups currently in the planning stage. 26. Where is the sun? I’m sure we all have a list of locations we’d like to photograph, and if you’re like me there’ll be a particular time of year you have in mind for the shot. I usually plan around seasonal weather, when flowers are in bloom or crops are growing, but I also consider where the sun will be rising or setting. We all know the sun rises in the east and sets in the west, but that’s only a generalisation. In the winter, the sun rises south of due east, and its position moves south each day until, on the winter solstice, it rises in the south-east before beginning to move north again. Some places only catch the first or last light in the winter months when the sun rises and sets in a southerly position, so make a note to visit these places in winter and catch them in the best light. For most of the year, the best light is around an hour either side of sunrise or sunset. Once the sun is high in the sky, the light can be too harsh and flat for a lot of landscape photographers’ tastes. On short winter days, however, the sun travels on a much lower arc than normal, providing us with a pleasantly angled light throughout the day. Of course, on some winter days you might not see the sun at all, so make the most of it when you do and shoot all day! Advanced as they are, the meters built into our cameras basically assume that all subject matter is of ‘average’ tonality, measuring the light reflected from the scene and averaging it to 18% grey. Most of the time it’s accurate enough, but when faced with an expanse of white snow, left to its own devices your camera will underexpose it and turn the snow grey. So ignore what your camera tells you, and if you are using one of the semi-auto modes, dial in 1-2EV of positive exposure compensation, or if you are using manual mode decrease the shutter speed by 1-2EV and keep your snow white. A fresh covering of snow removes all clutter from a scene, making it possible to find simple, graphic compositions, especially when working in mono when the palette can sometimes be literally black & white. Just make sure you get out early for pristine snow.